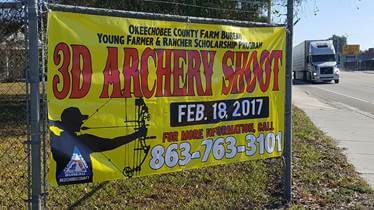 The Okeechobee County Farm Bureau holds an annual 3D Archery Shoot to help promote Young Farmer and Rancher Development. The leadership fundraising event includes vendor displays showcasing new products to benefit local farmers and ranchers. Proceeds from the event support Young Farmers and Ranchers Leadership scholarships. 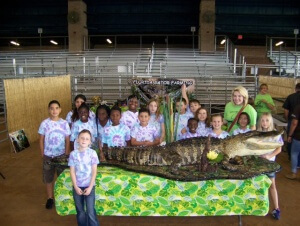 More than 400 students participate in the Okeechobee Ag Venture program each year. Students have the opportunity to visit with local farmers and ranchers and learn about local agriculture with hands-on activities such as garden-in-a-glove, beef-o-bingo and churning butter. Commodity booths include dairy, beef, vegetables and honey.